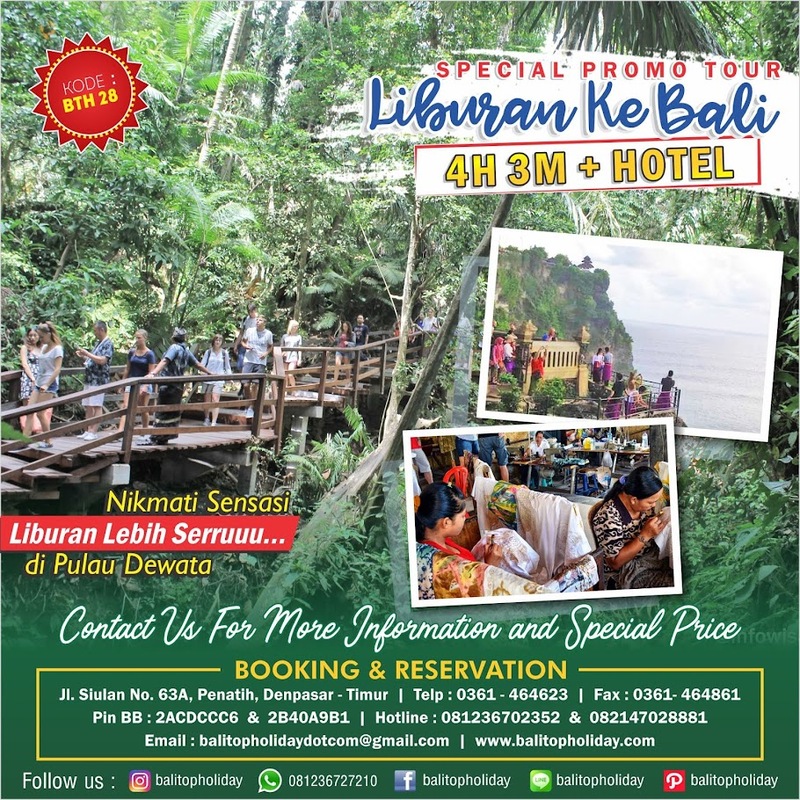 - Tour ke desa Nusa Lembongan (village tour), mengunjungi rumah goa dan pengolahan rumput laut. - Untuk aktivitas di Beach club – anda dapat berenang di kolam dan main seluncur (water slide), main voli. - Makan siang di Beach club dengan menu daging dan ikan bakar serta tea or coffee gratis pada saat makan. - Daging dari Australia, ikan segar dan masakan dengan bahan berkualitas. Antar jemput dari hotel (p-p), breakfast (bread), makan siang, banana boat sepuasnya, snorkeling, waterslides, submarine (kapal selam), tour ke nusa penida. 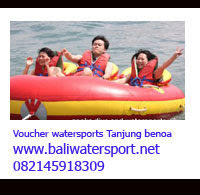 Scuba Diving, Jetski dan parasailing. Untuk biaya, bisa ditanyakan langsung di lokasi! 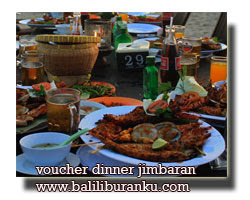 Bersama Bali Hai Sunset Dinner Cruise, malam Anda akan menjadi malam tak terlupakan selama berlibur di Pulau Dewata, Bali. 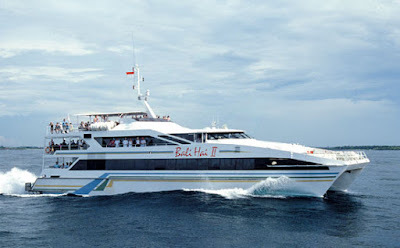 Bali Hai Cruises, operates exciting Day and Evening Cruises from a private reception facility at Benoa Harbour, Bali. Bali Hai Cruises visits Nusa Lembongan, located 20km off Bali's East Coast in what is known as the "Three Island region". The Island is approximately 4kms long and 2kms wide and is home to around 4,000 inhabitants. Nusa Lembongan and its sister islands, Nusa Penida and Ceningan, are surrounded by crystal clear water and spectacular coral reef which makes for fantastic snorkeling and diving. Aside from Tourism, the main industry on the island is seaweed farming. The seaweed is cultivated, harvested and then exported all over the world for use in cosmetics, food stabilizers and medicines. Other sources of income include traditional wooden boat building, farming peanuts, sweet potato crops, and fishing. You can have a sampling of this during our village tour. Experience the unspoilt charms of a peaceful tropical island with our Beach Club Cruise. After cruising in comfort to Lembongan Island aboard our luxury catamaran Bali Hai II, you are transferred to private Beach Club only minutes away. Here you can relax on golden sands, lie back in the shade of the tranquil gardens, or cool off in our lagoon pool. If the mood takes you, an array of activities includes pool volleyball, banana boat rides, snorkeling and island excursions. And to add to the tropical atmosphere there's an appetizing BBQ lunch, which includes salads and fresh fish grilled at our pool-side cabana. Our Island Reef Cruise offers a full day's activities - above and below the water. The luxury Bali Hai II catamaran moors alongside our purpose-built pontoon in peaceful Lembongan Bay. See the island's exotic marine life and colourful corals from the comfort of our semi-submersible coral viewer. Try snorkeling for a closer look or enjoy a host of other activities: unlimited banana boat rides, a cultural tour of the island or our exciting 35 metre waterslide. And when you've worked up an appetite, feast on a delicious buffet served in air-conditioned comfort. There's no better way to spend a balmy tropical evening than on Bali Hai's evening Dinner Cruise. As the sun goes down we set off on a relaxing cruise around the harbour. Take in the cool night air on the top deck, be entertained by our famous strolling Batakos Singers, savour a delicious international buffet dinner, then dance the night away at disco or enjoy live cabaret show. The unique design of the thatched roofed Hai Tide Huts is inspired by a traditional Indonesia rice house or Lumbung. All huts are fitted with ceiling fans, air-conditioners, and large glass doors which open out onto an intimate verandah perched two meters above a relaxing day bed. Hai Tide Huts guests can enjoy all the Bali Hai Cruises Beach Club facilities which include a large two tier lagoon swimming pool, Ocean Kayaks, snorkeling equipment, glass bottom boat, banana boat rides, volley ball, full bar and restaurant facilities. For the more adventurous, parasailing, surfing, fishing, and a range of island tours are also available. Bali Hai Diving Adventures can provide a world class diving service for guests at the Hai Tide Huts. Join one of many diving programs and add another dimension to your experience of Lembongan. Some of the best things in life are often the simplest! The Bali Hai Cruises Hai Tide Huts offer discerning travelers an opportunity to relax and immerse themselves in the natural beauty and serenity of the unspoilt tropical paradise island of Nusa Lembongan. Stay a night and you will not want to leave! The following lists some of the activities available from the Hai Tide Huts. Ever dreamt of being swept ashore onto your own private island paradise? Begin the morning sailing to Crystal Bay in Nusa Penida onboard Aristocat, our 64ft luxury sailing catamaran. Located on a remote tropical island, you'll be swept ashore at Crystal Bay, exclusive to Bali Hai Aristocat guests only. Named because of its crystal clear waters, guests will have the opportunity to snorkel some of Indonesia's best coral reef, teaming with tropical marine life. After a tropical bbq lunch under the palms, visit the rustic village and watch traditional wood carvers and sarong weavers at work. Have the opportunity to taste the local food 'cassava' and meet the islanders as they make flower offerings for their temple. The Castaway experience is a complete haven of relaxation. Massage is available to guests throughout the day or simply relax in a hammock overlooking the bay. Castaway Cruise program operates every Tuesday and Thursday between the months of 1st April- 31st November. During non operational months Aristocat will sail daily to Bali Hai's Private Beach Club at Nusa Lembongan. Begin the evening with a champagne cocktail and canapés in our Marina garden then be welcomed onboard Aristocat, our 64ft Sailing Catamaran , to the sounds of classical string quartet. Aristocat, strewn with twinkling lights, will set sail towards Nusa Dua for an evening of fine dining and entertainment. From the sumptious fresh food to the sounds of the sea, Aristocat Evening Cruise promises a truly memorable evening aboard. Sail away into paradise aboard Aristocat - The Luxury Sailing Catamaran. This stunning 64ft vessel is equipped to the highest standards and departs from Benoa Harbour to the idyllic isle of Lembongan, off the south-east coast of Bali, where you can experience the unspoilt charms of a peaceful tropical island. Enjoy a day in the pristine bay at Bali Hai Cruises private Beach Club, where you can relax on golden sand, lie back in the shade of tranquil gardens or cool off in a lagoon pool. Complimentary soft drinks and refreshments are available on board Aristocat. At the Beach Club enjoy an appetizing BBQ lunch grilled at our poolside cabana, which includes salads, sausages, and fresh fish. After lunch, join a guided village tour of this small unspoiled island, home to seaweed farmers. The Aristocat offers an array of water sports activities, including banana boat rides, pool volleyball, snorkeling, semi submersible coral viewer and glass bottomed boat tours. Other water sports options include a parasailing adventure which will take you high above the water for a birds' eye view of the island and scuba diving. Certified divers may travel further a field to experience life beneath the waves in this vibrant ocean channel. Experience Bali's fastest and most exciting full day cruise as you discover the magnificent sights of Bali's three sister islands. Ocean Rafting, designed with the highest safety standards and equipped with 750hp, promises an exhilarating day of sight seeing and snorkeling at some of Indonesia's finest pristine coral reefs. Sit Down, hang on and let's go! - Visit pristine bays, snorkel, swim or go beach combing on deserted beaches. - Visit one of the many small seaweed farming villages. - Visit to Lembongan Bay marine park and Bali Hai Private Beach Club. The daily Ocean Rafting itinerary will be determined by prevailing weather conditions. The Ocean Rafting 3 islands day cruise does not have a fixed daily itinerary and will vary from cruise to cruise in an effort to maximize passenger's enjoyment. Each cruise will always include a variety of sightseeing of 3 islands, high speed cruising and snorkeling. Add another dimension to your holidays The underwater dimensions. Pioneers of Nusa Penida/Nusa Lembongan drift dive sites and Bali's leading authority on the Mola Mola interaction, Bali Hai Diving Adventures have been providing safe and exhilarating diving services in Bali since 1991. Specialists in tailoring Dive Safari's for individuals or special interest groups, we provide day trips and extended stay programs for divers of all levels, at all of Bali's world class sites. With 4 Dedicated Dive Facilities managed by PADI Professionals strategically located adjacent Bali's best dive locations and on GILLI Trawangan Lombok, no company is better positioned to ensure your diving experience in Bali is safe, rewarding, exhilarating and fun. Programs and amenity for Non Diving Companions and children are available at all locations.